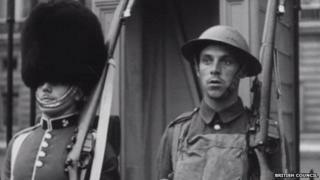 An online archive of films showing snapshots of typical life in Britain in the 1930s and 1940s has been completed. The final 25 movies in the collection have been digitised and loaded onto the British Council's website. Scenes include the pubs of England, Sheffield's steel industry, London's preparations for war and a mystery for Scotland Yard's Flying Squad. British Council director of film Briony Hanson said the movies gave a glimpse of what had changed and what had not. The British Council - the UK's cultural relations organisation - had already made 89 titles available since the archive was launched in 2012. They were produced in the early years of the British Council to showcase the best of the UK to audiences in embassies, consulates and classrooms around the world. Ms Hanson said: "These films give us one last glimpse into a Britain that's different and familiar in equal measure. "Some things like air raid shelters in London's parks and a Sheffield dominated by the steel industry are things of the past - but there are also trips to the pub, police dramas and, of course, a lot of tea. Among the new releases are police story Routine Job (1946), The Story of English Inns (1944), War Comes to London (1940), and Steel (1945) about steel-making and the workings of a foundry. The British Council has also launched an international competition called View From Here to encourage people to respond to the collection by re-editing the existing films, producing new ones on similar themes or a combination of the two. Oscar-winning film-maker Kevin Macdonald, Bend It Like Beckham director Gurinder Chadha and broadcasters Claudia Winkleman and Edith Bowman will pick the winners. The council has also commissioned British film-makers Mark Cousins, Penny Woolcock and John Akomfrah each to produce a short work based on the collection.